I would just like to say that I think it’s crazy that Firefly is in the 26th week and is still barely showing. She’s not even in maternity clothes yet! Although much of that is because she lost some weight leading up to our trying for this monkey and kept all the clothes that were too big for her in anticipation of this very thing. She is definitely getting to the end of them, but still! She’s tall, so she’s got a lot of up for him to stretch out into. She’s measuring exactly as she should, though, and the OB said she’ll probably keep stretching up for another few weeks, and then she’ll really pop. She is to the point now–I think–where it’s obvious that she’s pregnant even to strangers, but I doubt they’d guess she’s as far along as she is. I’d show you a picture, but she’s made me swear I won’t show them to anyone. Sorry. Anyway, we were very productive today. We got some things moved around, including a shelf/cabinet thing that we moved from our bedroom into the future nursery, some tools that were in there moved out, and our friends came over to help with the TV which was so awesome of them and a huge, huge help. 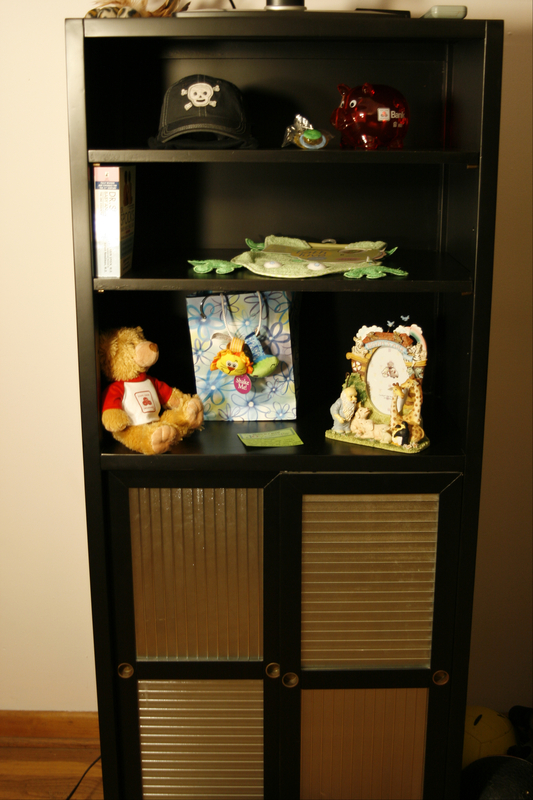 The bottom cabinet part has some other baby things in it–a few onesies, some diapers, that sort of thing. Of course, one of the friends is the captain of Firefly’s dart league and they asked if I was going with her tomorrow. I usually don’t because she has to bring me home, and if it runs late I don’t want her to have to worry about getting to work on time and it’s silly to take two vehicles. They offered to bring me home if time was short, though, and I feel it’s the least I can do since they were so helpful today, right? Guess I’ll have to mow the lawn on Thursday. It’s supposed to storm again tomorrow anyway.